Tyler has a passion for Woodstock Chimes. Owning nearly 100 chimes, he can identify Woodstock Chimes by name simply by hearing their sound. We invited Tyler and his parents to visit our headquarters in Shokan, NY and meet Garry Kvistad, a Grammy award-winning musician and the owner of Woodstock Chimes. Garry fell in love with Tyler and his story, which prompted him to create a new windchime in Tyler’s honor: “Woodstock Chimes for Autism”. We are attempting to partner with those involved in this great cause to help increase awareness. 100% of the after-tax profits of the Woodstock Chimes for Autism are donated to autism treatment programs and research. We are extremely proud of this video, and hope you will take a few minutes to watch and share Tyler’s story! You can see it at www.chimes.com/autism. Inspired by an 8 year old boy with autism with a particular acuity for music, we’re proud to offer Woodstock Chimes for AutismTM. Meet Tyler and understand the special story behind the design of this very special wind chime. Tuned to the opening notes of Mozart’s Piano Concerto #21, this chime’s happy, calming song is made even more appealing because of the significant cause it supports, Autism Awareness. One aspect of autism can be hyper-sensitivity to sound. This musically-tuned chime is designed with a specially-sized clapper so its soothing tones play more gently in the wind. We thank our friends at Woodstock Chimes for their Charitable Chimes Program, established to offer the wonderful sounds of select Woodstock Chimes with an equally wonderful bonus – a give-back feature. 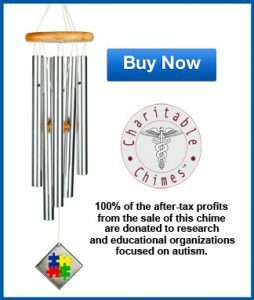 100% of Woodstock Chimes’ net profits of the sale of the Woodstock Chimes for AutismTM are donated to autism treatment programs and research. We are grateful , and honored, to have been named a beneficiary of the net proceeds of the sale of every Woodstock Chimes for AutismTM. These special wind chimes make a beautiful addition to any outdoor setting, and a lovely gift for someone special. Order yours today, and you’ll be supporting Center for Spectrum Services! Click the Image below to purchase Woodstock Chimes for Autism™ using our order form.